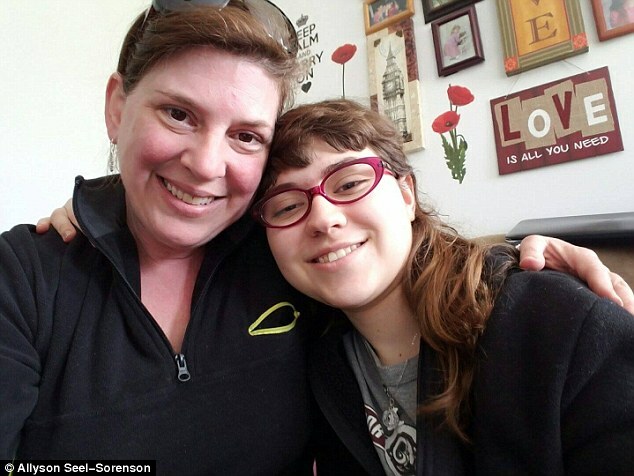 An autistic girl was left ‘crying into her birthday cake’ as she celebrated her 18th birthday alone after none of her friends turned up to her party. Hallee Sorenson from Bangor, Maine, invited all her friends and classmates to help celebrate her special day with bowling and ice cream cake, in July last year. Her mother, Allyson Seel-Sorenson, took a heartbreaking photo of her daughter sitting alone in front of her cake with a party hat on because she ‘didn’t know what else to do’. ‘I was hiding behind a pillar crying and sent the picture to my husband asking him what I should do. I didn’t know what I should tell her,’ Mrs Seel-Sorenson told Daily Mail. ‘My daughter was finally wanting to celebrate her birthday with friends, she was so excited and so were we because we were able to give this to her. But then no one showed up. Now, almost 12 months on, a picture of the girl sitting ‘heartbroken’ and alone at her birthday table has gone viral, after her cousin shared the photo on Facebook in the hope that Hallee won’t have to celebrate alone ever again. Rebecca Lyn used the power of social media to spread the word about her cousin’s sad story, pleading with others to send a birthday card to make this year’s celebration ‘incredible’. ‘She is a person who just happens to have Autism. She has never let that small detail define who she is as a person-which is why I refuse to use it as something to describe her,’ Ms Lyn wrote. ‘But you can help make this years birthday incredible! Ms Lyn wrote the post on Wednesday and it has gone viral over the 48 hours since, receiving more than 120,000 shares. She didn’t tell her aunt about the post until it had already had thousands of shares. ‘She called me and said “I hope you still love me and don’t mind” when she realised how far the post had gone,’ Mrs Seel-Sorenson said. In the post Ms Lyn said the show of support would not only give her young cousin a mental boost, but it would also put a smile on the face of Hallee’s mum. ‘If you could find it in your heart to take a few mins out of your day and send her a card, I would be forever grateful,’ Ms Lyn said. It seems Hallee can expect an influx of well wishers, with respondents pledging to send everything from jewellery to t-shirts. However Ms Lyn has insisted that a simple, thoughtful card ‘will be just fine’. The main thing, she said, is that this ‘beautiful young woman’ has a smile on her face when her birthday comes around this year. Halle’s mother is preparing for the cards and has even told the postman to expect some more mail than usual in the lead up to July 2. ‘I will let her open a few cards before the day, but I will keep most of them for her birthday. ‘We have a map of the world at home that we will stick pins into so Halle can see how far the cards have come. Halle will be having a party at home with her family this year to mitigate the risk of no-one showing up. ‘When she looks at the photo of herself at her last birthday she looks away,’ Mrs Seel-Sorenson said. ‘She says ‘I was alone’ and that is heartbreaking. Halle’s little sister Maddy, 13, was at the party with her sister when the 20 people on the invite list didn’t show. ‘She was really angry at people and didn’t understand why Halle didn’t seem to matter as much as other people. The mother hopes that this post will help people realise children with disabilities like Halle want to be included too.